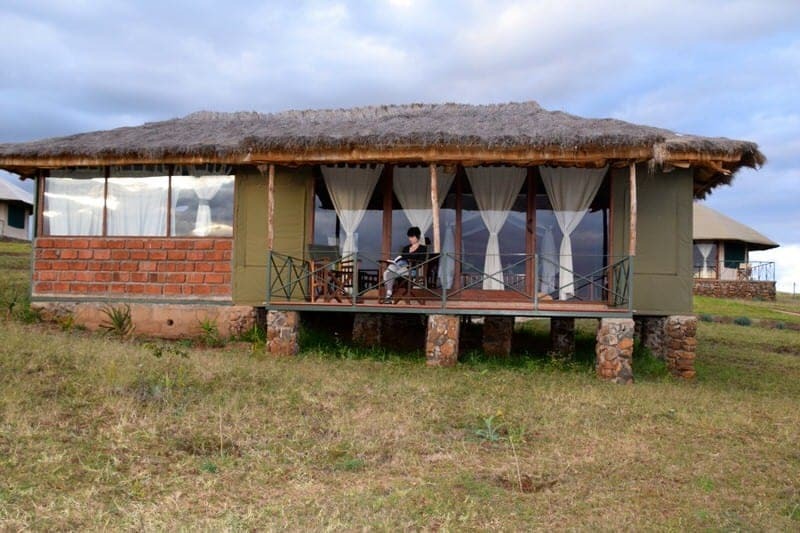 Karatu Simba Lodge is a new eco-friendly lodge located near the Ngorongoro Forest in Tanzania. Many safari travelers stop for a night in Karatu because of its strategic location between Lake Manyara National Park and the Ngorongoro Conservation Area. The Karatu Simba Lodge is committed to environmental conservation with its reliance on solar power and emphasis on water conservation; however, the lodge also offers all the amenities that weary safari travelers will be wanting after a day of bumpy, dusty roads, including en-suite flush toilets and hot showers, wireless internet, a swimming pool, complimentary afternoon tea and coffee, and nightly campfires. 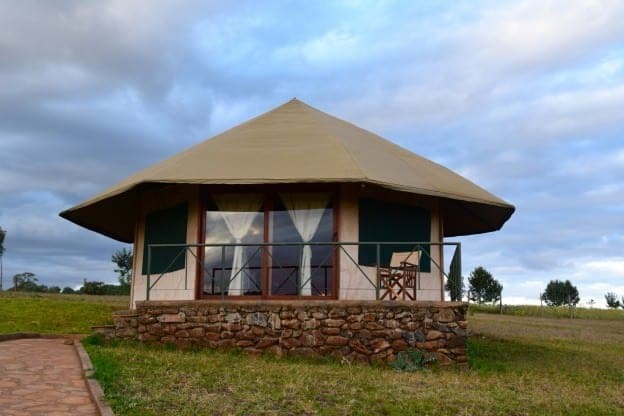 The lodge sits off the main road along the northern safari circuit amongst a series of small farms and offers beautiful views to the Ngorongoro Conservation Area Forest. If you’re lucky you might even get to spot elephants, buffalo, baboons, or other animals wandering outside the forest from the safety of your own private deck. 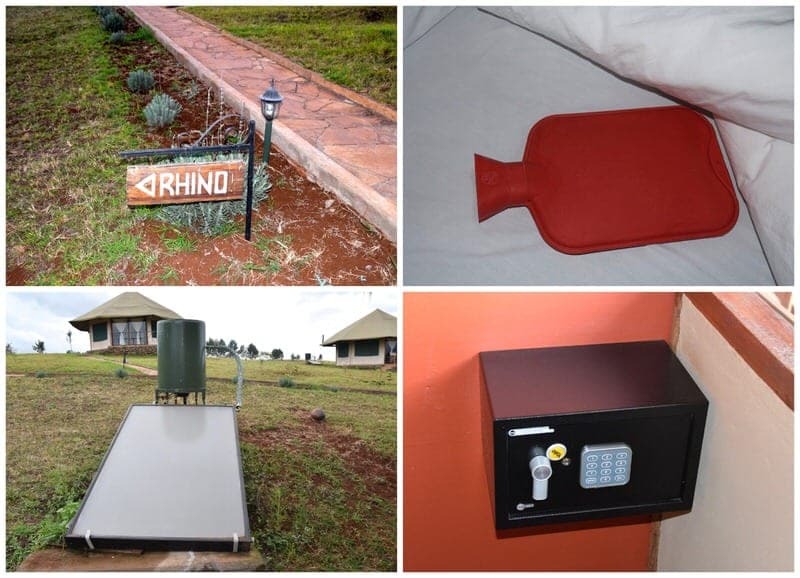 Karatu Simba Lodge is designed for visitors who are looking for a peaceful and scenic place to rest their heads, and we’ll tell you all about our recent two night stay at this lodge. 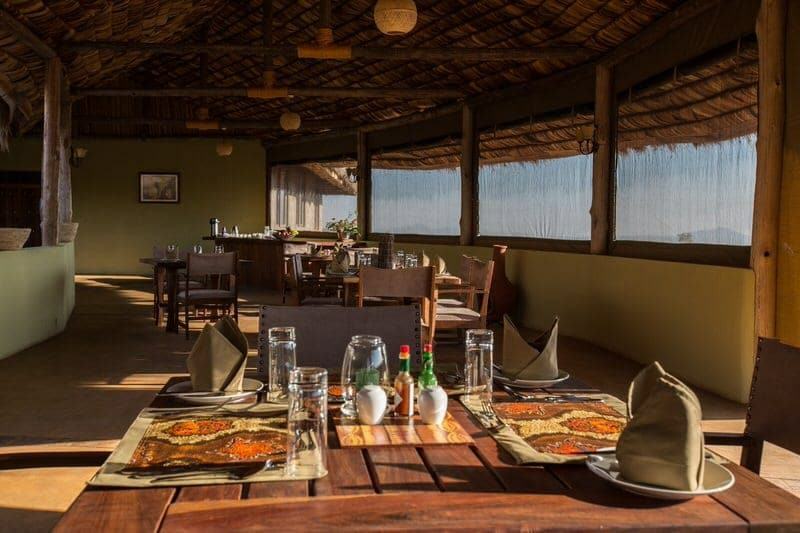 Location: The lodge is located near the village of Rhotia, outside Karatu town. It is located between Lake Manyara National Park and Ngorongoro Crater. Driving, it is approximately 1 hour from Tarangire National Park, 30 minutes from Lake Manyara National Park, and 30 minutes from the Lodware Gate of the Ngorongoro Conservation Area. Getting here: The lodge is located about 2.8 miles (4.5 km) off of the main road. You’ll take a turn in Rhotia. Your driver will have directions or the lodge can provide detailed driving directions upon booking if you are driving yourself. Room cost: Room pricing depends on the season, with rates for a single room ranging from $100 to $175 per night and rates for a double room ranging from $190 to $300 per night. Triple rooms also available. All lodging rates include full board (three meals). No children under 5 years of age are allowed. Heading to the Serengeti? 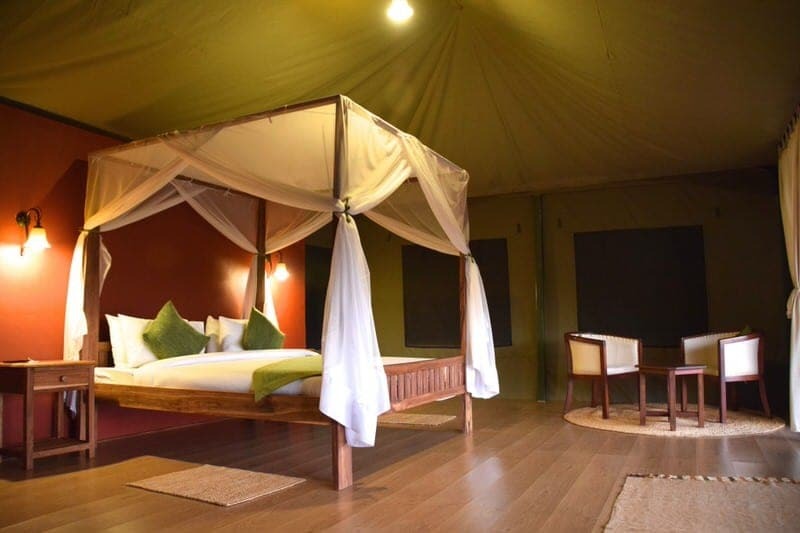 : Simba Portfolio also operates a second sister property called Serengeti Simba Lodge which is located in the migration path near the Fort Ikoma gate of Serengeti National Park. The morning of our arrival, we had breakfast and checked out of Machweo Wellness Retreat in Arusha, met our new Amani Afrika driver and guide Muridy, and headed to Tarangire National Park to officially begin our safari in Tanzania! Ethan and I were both still tired and recovering from returning from our Mount Kilimanjaro climb the prior day, but the 3 hours or so we spent doing game drives in Tarangire National Park were really wonderful. The park is best known for its large herds of elephants, baobab trees, and large number of bird species. After the game drive, we headed to Karatu Simba Lodge. We actually drove past the turn off to Karatu Simba Lodge as the sign is fairly small and easy to miss. But once we turned around in Karatu after going too far, we spotted the sign for the turn-off near the little town of Rhotia. 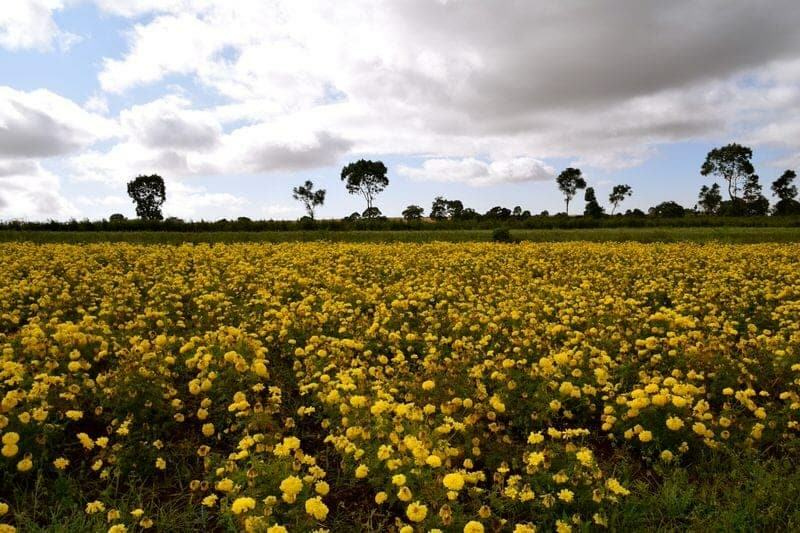 We then followed a somewhat bumpy dirt road, but it’s worth it to get off the main road to take in the pastoral views of homesteads, farms, and gardens along the way. Flowers have been planted in some of the fields near the lodge and there were fields of bright red and yellow flowers in bloom during our visit, which reminded Ethan of our time in Provence. As soon as we got out of the jeep, we were greeted by three friendly staff members who handed us wet towels and cold drinks, and helped us with our luggage. The check-in process went smoothly with Celina, the very competent and friendly receptionist, at the front desk and then we were led to our cottage. The Karatu Simba Lodge currently offers 6 tented rondavels (a Western version of traditional African huts) and 7 cottages, although it will soon be adding several more guest units. Individual twin, double, and triple accommodations are available. 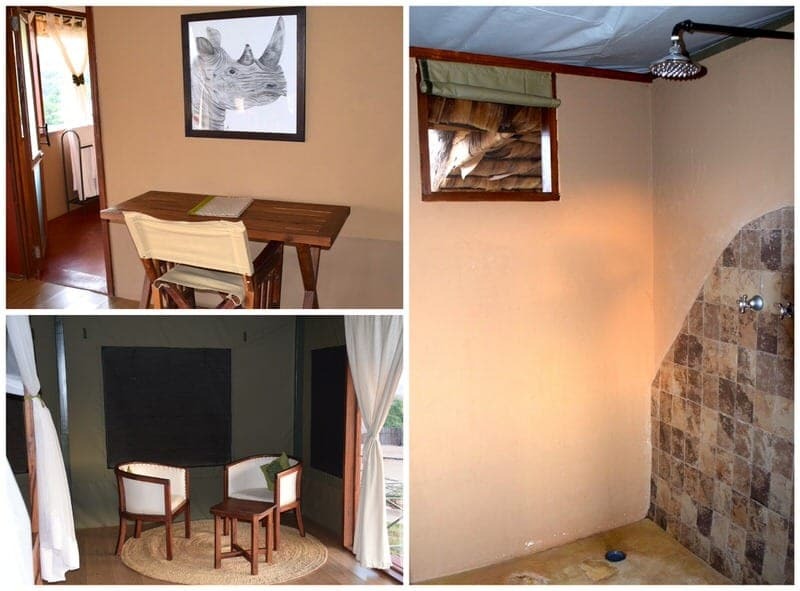 We were specifically in the “Rhino” double cottage, which is now a bit ironic as we sadly never saw a rhino during our safari time in Kenya or Tanzania. 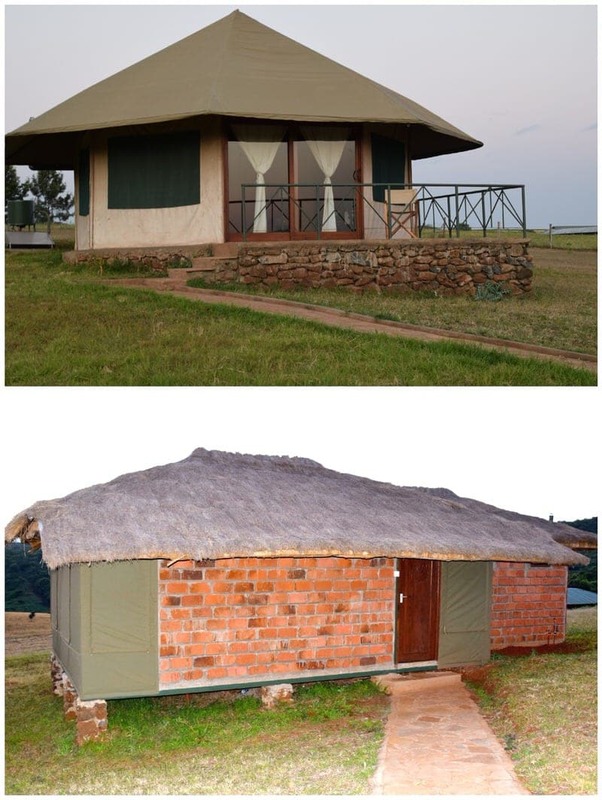 The construction of the cottages is interesting; they are a hybrid of a tent, cottage, and hut with canvas walls, partial brick exteriors, solid attached bathrooms and shower, and a thatch roof made of local straw. We enjoyed our unique cottage as we were able to hear the nature outdoors and feel like we were in Africa but still enjoy good plumbing and a clean comfortable bed. The units are simply but tastefully decorated with hand-made wooden furniture, functional rugs, a four-poster bed, a small writing desk, and two armchairs. 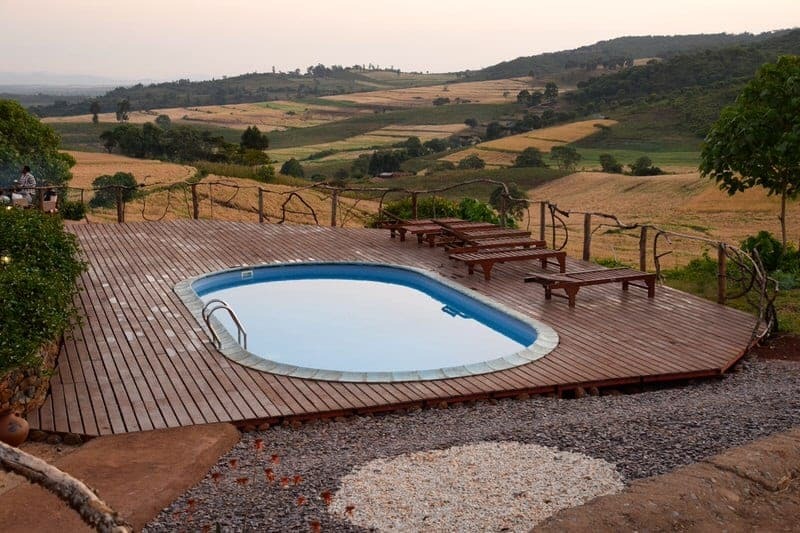 Perhaps one of the best things was our own little deck with two canvas safari chairs that offered great views of the Ngorongoro Forest and distant Mbulu Hills. We appreciated the thoughtful additions of a wall safe, electrical power strip, flashlight, and umbrella in the unit. For safety, Maasai guards escorted us to and from the cottage after dark and we were also provided with a whistle and flashlight. Since the lights run on solar power they are dimmer than normal so you may want to bring a headlamp or booklight if you want to read at night, and I should note that you cannot use a hairdyer at the lodge. We were grateful that we were able to charge our camera batteries and laptop with the provided power strip. After returning from dinner, we were happy to find that the mosquito nets had been put down and two hot water bottles had been put into our bed! 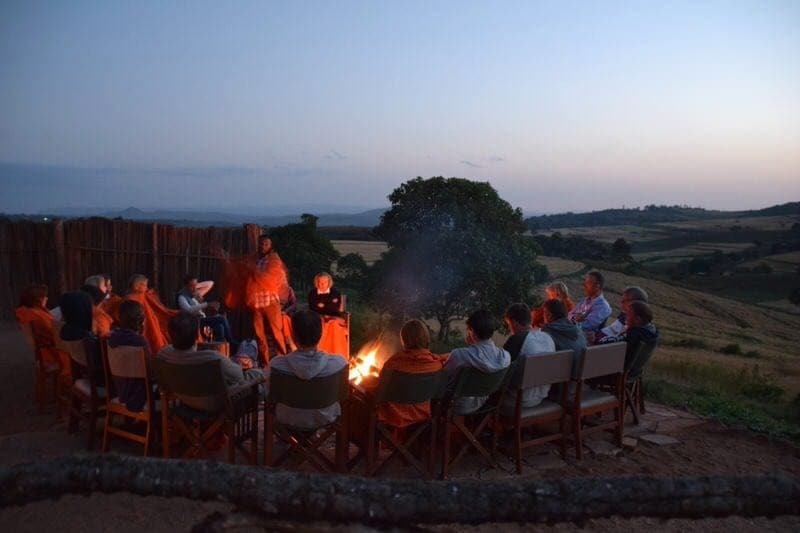 Despite lying close to the equator, the area around Karatu and the Ngorongoro Conservation Area can still get chilly in the evenings and we were quite grateful for the extra warmth. If visiting during the colder months (June-September) you might want to bring along some warm nightclothes. One great thing about staying at the Karatu Simba Lodge is that the room rates include all three meals as well as complimentary afternoon tea and coffee. Meals are served buffet style in the main lodge dining room. We were always asked about our preference for meal times which seemed like they although they happened during a set range of time, the dining times were flexible dependent on guest needs. Breakfasts also include a made-to-order egg station, which we took full advantage of both mornings of our stay. 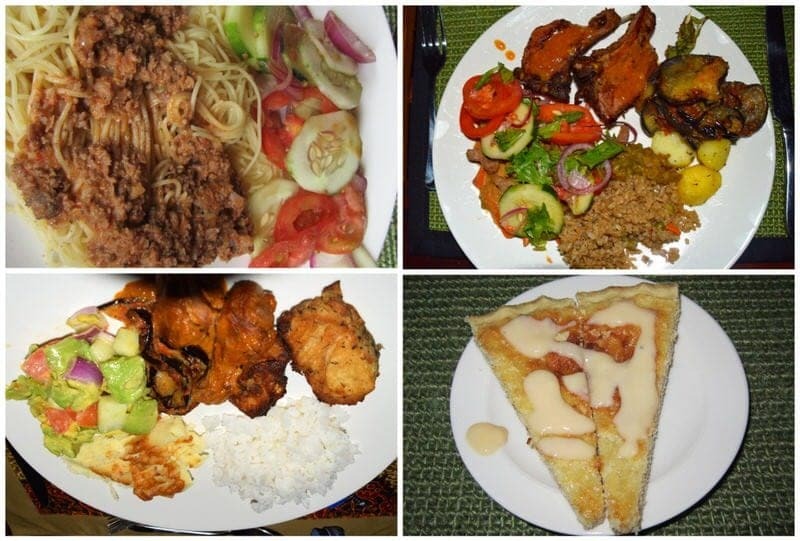 During our visit, the food was a mix of Western food, Indian food, and local African food. Most of the fresh produce used at the lodge is locally grown on nearby farms and the coffee is sourced from a neighboring plantation. Guests should not expect gourmet dining, but all the food we had at the lodge was very tasty and filling. If you are going to be out during the day on safari or doing a tour, meal boxes can be prepared with advanced notice. On our second day at the lodge, we did a tour of Karatu and a local Iraqw village and the lodge prepared lunch boxes for us and our guide. 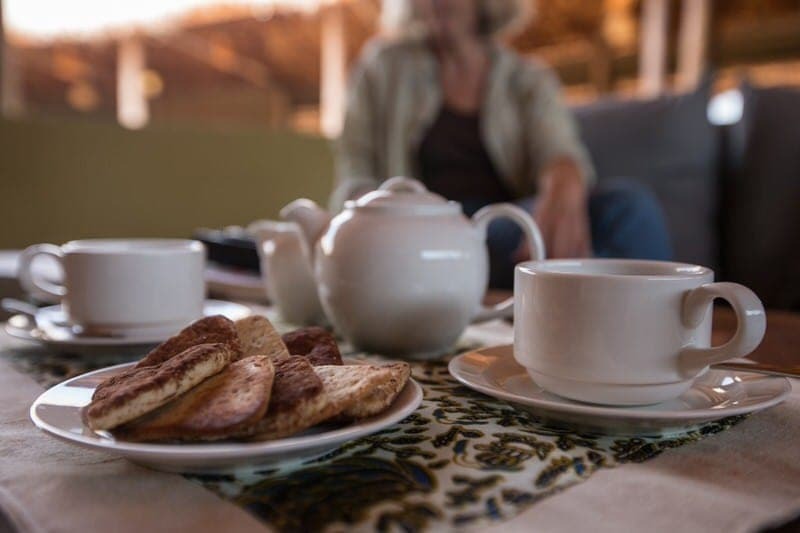 During our stay, we also took advantage of the free tea, coffee, and cookies that are provided at a self-service station in the lounge every afternoon. 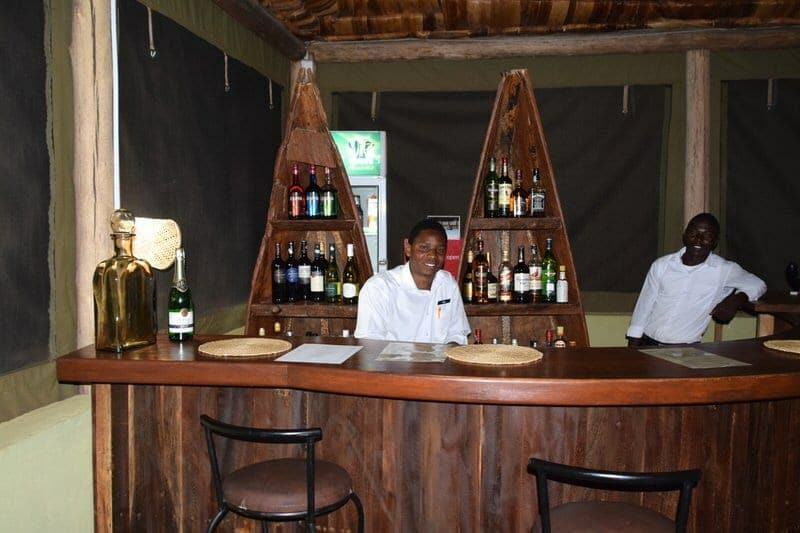 There is also a small but fully-stocked bar at Karatu Simba Lodge and while we didn’t actually drink here, we chatted with the friendly bartenders. Our one dining complaint was related to the coffee. Sometimes during meals and afternoon tea time, we would be served freshly brewed coffee whereas at other times given instant coffee, and we would have much preferred the fresh coffee, especially given that it is locally grown. That being said, when we requested freshly brewed coffee, the servers always then made some for us. The only other potential issue we noted is that it is quite dark in the lodge after sunset since the lodge relies on solar power. There is of course lots of lamps, candles, etc., but do expect low lighting in the evening. 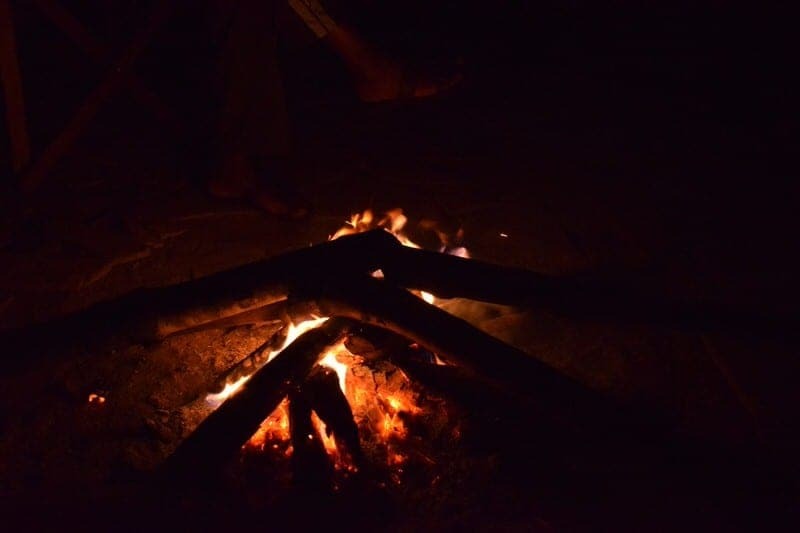 The advantage of the darkness is that it makes for intimate, romantic atmosphere and makes the appeal of the campfire and views of the stars all that much greater! During the evenings, red Maasai patterned blankets are place over diners’ chairs that can be used to put over your shoulders if you’re chilly and can be taken outside to be used next to the campfire. We found these blankets to be very welcome campfire accessories! 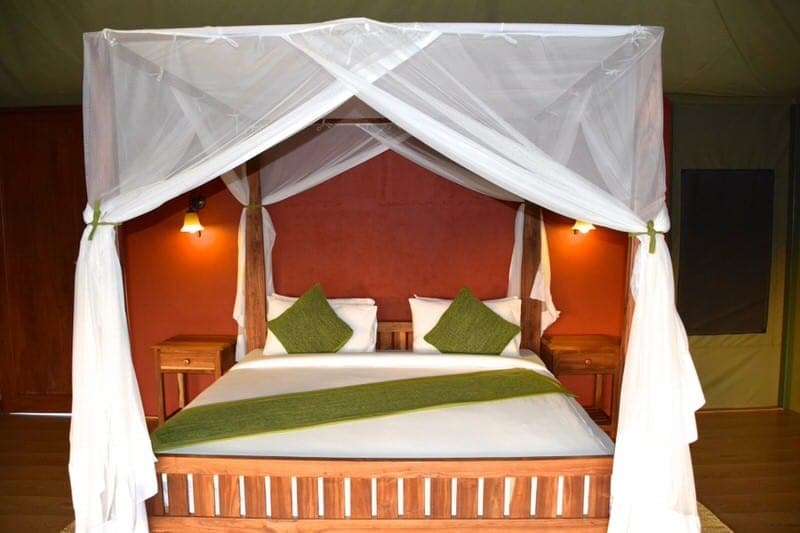 Amongst the offered amentiies, the Karatu Simba Lodge offers complimentery wireless internet, a nightly campfire, an outdoor swimming pool and sundeck, laundry services, and local cultural tour arrangement services. Now, the wi-fi only works in the main lodge and is a bit slow compared to our Silicon Valley standards, but the lodge’s lounge provides a comfortable place to check your email, update your social media accounts, check your bank account, and even perhaps do a little blogging. We took advantage of the reasonably priced laundry services and we were happy to have a replenished supply of clean clothes as trekking and safari really gets you dirty! We also took advantage of three of the many town and cultural tours that Karatu Simba helped arrange with local guides. We specifically took three tours from the Ganako Karatu Cultural Tourism Organization to explore the surrounding area and we will be writing about those in our next post as Karatu has much more to offer than being a convenient stop-over town between game parks. 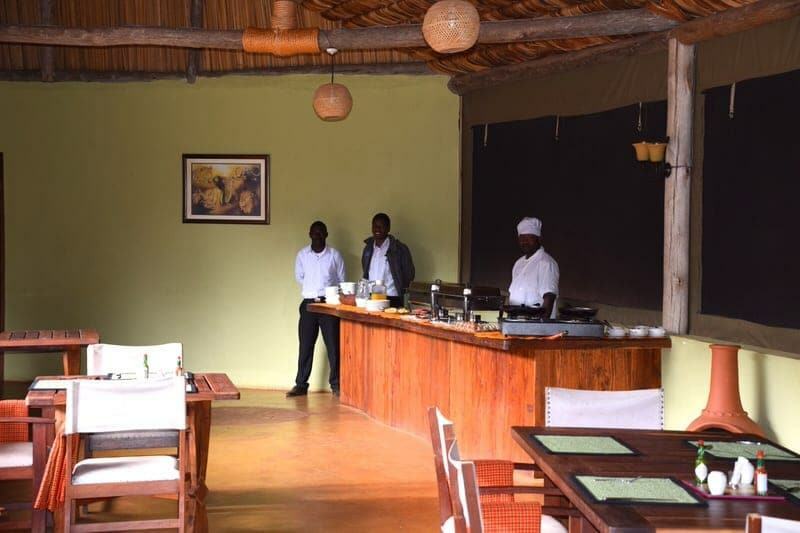 One of the things that stands out about our stay to Karatu Simba Lodge is the staff. 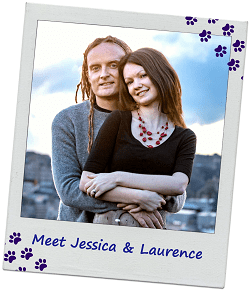 From the moment we arrived to the moment we departed, the staff were friendly, dedicated, and helpful. There was always someone around to help us or ask a question and we found that the staff always seemed to be cheerful and smiling. Even if some of the staff did not speak perfect English, it was clear that they were always trying to be helpful and understand the needs of the guests. It was also notable that our guide Muridy reported being well-treated here and was able to dine with us if he wished at all meals as this was not always the case at every accommodation. 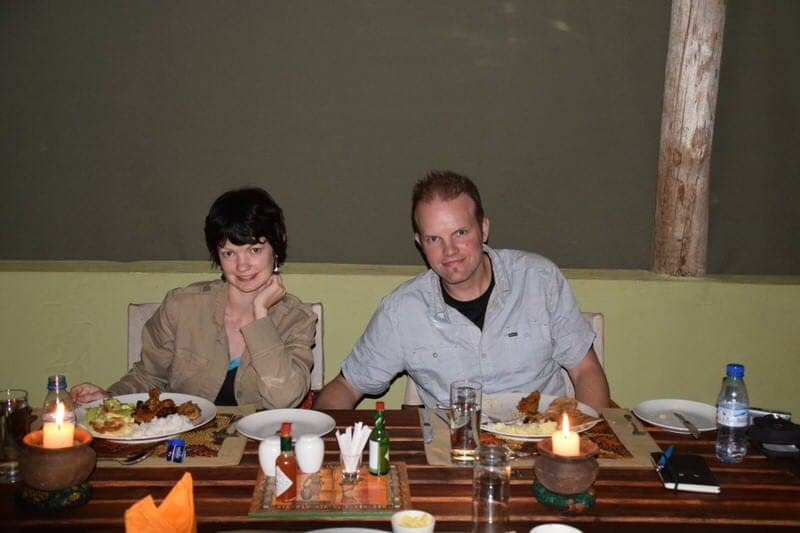 We especially got to know the Manager and Marketing Director, Annie Birch, who not only made sure the lodge was running smoothly but also took the time to give us plenty of suggestions for how to make the most of our time in Karatu. We stayed at Karatu Simba Lodge for two nights and overall we experienced good lodging, food, and hospitality. 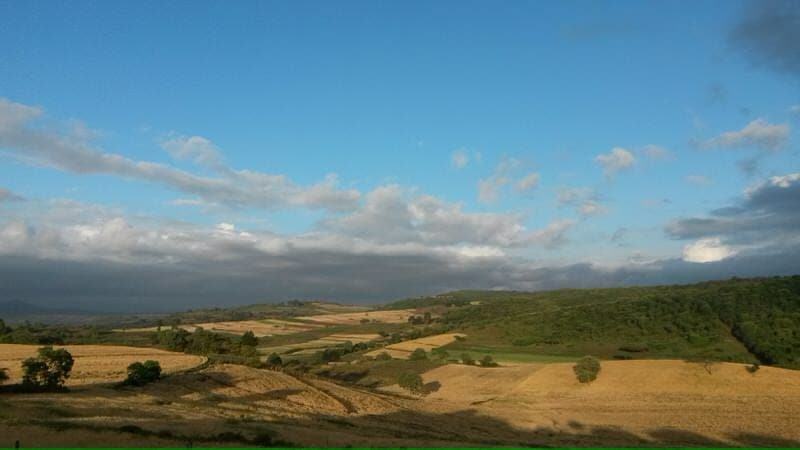 The two biggest assets at the lodge are its friendly staff and its excellent views. The location of Simba Portfolio properties are specifically chosen based on their scenery and offered viewpoints, and this property offers some spectacular views towards the Ngorongoro Forest. It also allows travelers to get off the main road and experience a slice of the peaceful rural life among the Iraqw farmland. 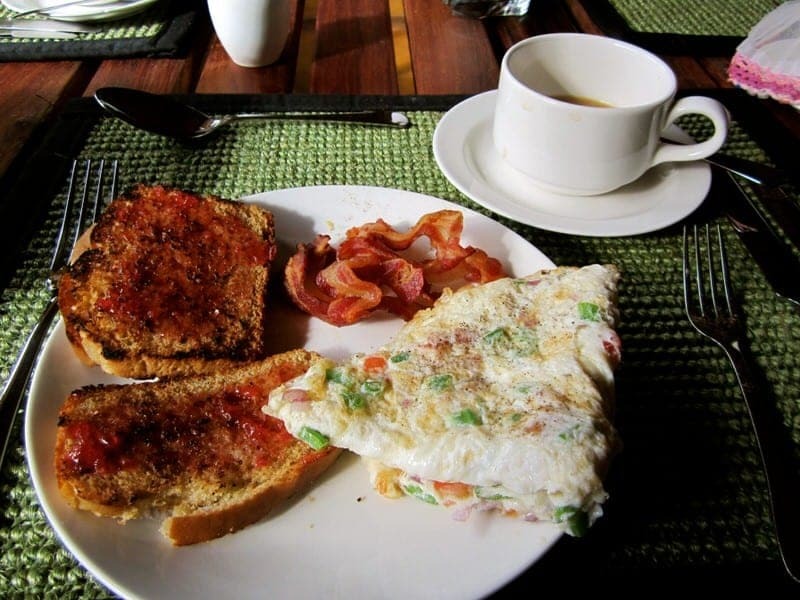 The lodge is also reasonably priced and offers excellent value for the money as all food costs are included as well as little extras like complimentary afternoon tea and wireless Internet. This lodge should also appeal to those who care about the environment as the lodge runs off of solar power and places emphasis on water conservation, although inconveniences such as dim lighting, lack of hair dryer use, and unexpected power outages during cloudy weather can result and may not sit well with all travelers. 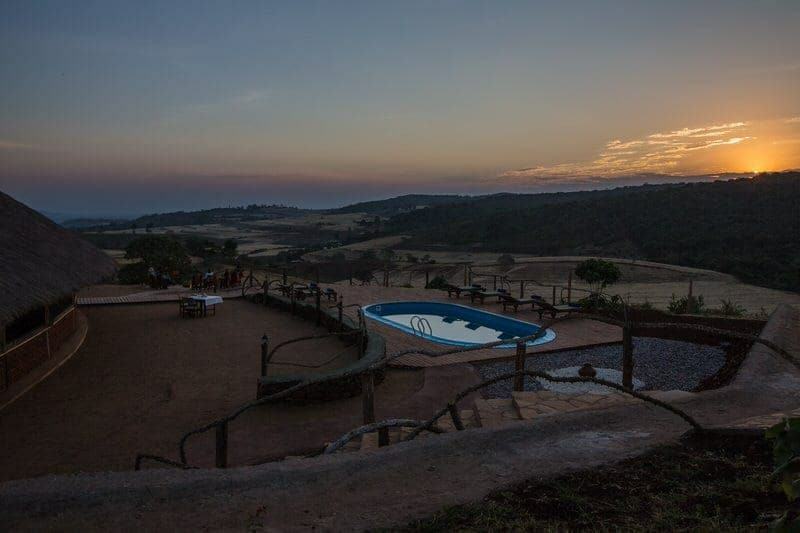 If you are going to be staying near Karatu and are looking for a peaceful place to rest with excellent views, friendly staff, must-have amenities, and which offers good value for your money then we would definitely recommend that you check out Karatu Simba Lodge. What are the top things you look for in a hotel before booking? Have questions for us about our stay at Karatu Simba Lodge or things do do in Karatu? As always we welcome any comments or questions! This place is truly pretty! 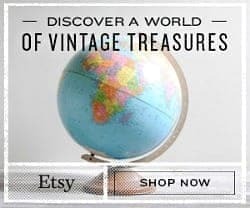 Love reading all about your travels! Stunning! What some lovely photos. We visited Ngorongoro in 1983 – I bet a lot has changed since then! You begin to get a bit tired of buffet food in Africa after a few days of it, but it is all typically quite good! The soups and meats were always very good in our experience. Wow, this places looks absolutely awesome! I’ve been dying to go on an African safari ever since my parents went a few years ago. It’s definitely on the bucket list, and this place looks like the perfect eco-friendly getaway. Thanks for sharing! Ah, too bad you didn’t get a chance to go with your parents:) Hopefully you’ll get to do an African safari some day soon. Yes, this is considered among the more affordable lodges. We were pretty surprised at how high the prices are for lodging in Africa and the lodges located inside the national parks and conservation areas are even more expensive as not only are you paying extra for location but the lodges themselves pay high fees to the government for the great location. Yes, very civilized and the Rhino Cottage was great, although ironic that we didn’t see a rhino. Only one we missed out of the “Big Five”! It really was a beautiful lodge and some great views! What a beautiful property. 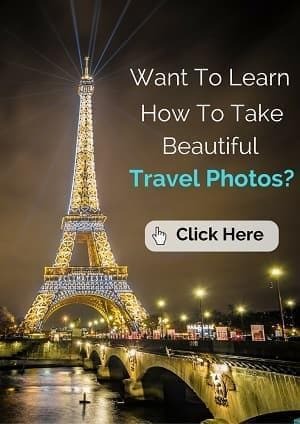 It seems to be the perfect blend of what Westerners are used to and local environment, and I am really impressed with the photos of your room. I hope we will have an opportunity to visit here when we finally get to Africa, as I think it would be a good place to recharge for a few days.. I hope you get a chance to visit Africa! 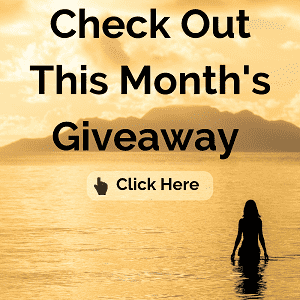 We had so many memorable travel moments during our time in Kenya and Tanzania and I definitely see why an African safari is such a once in a lifetime trip for so many people. If you enjoy eco-friendly spots and find yourself traveling through Karatu, I would check out Karatu Simba Lodge. I love the idea of ecotourism but haven’t sought it out yet. What a lovely way to see the Serengeti. And the staff sound really nice! Hi Em, this lodge is actually in Karatu but they also have a sister lodge in the Serengeti National Park. Both are eco-friendly! Those cabins look really nice and comfy! It’s so amazing that they are so ecologically conscious as well! also, I love that shot of yours with Ethan holding a spear. I think Jess looks kinda awkwardly terrified haha! Thanks Teresa, you’re so sweet! 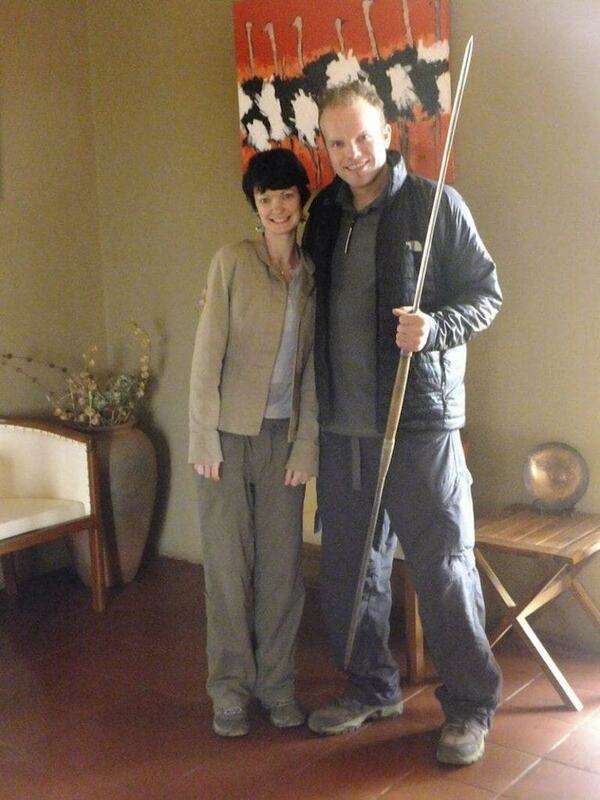 Yes, I do look a bit awkward in that Maasai spear shot, haha. Hi San, yes, I agree. Staying at a place for longer offers a great chance to relax and take in the local vibe!